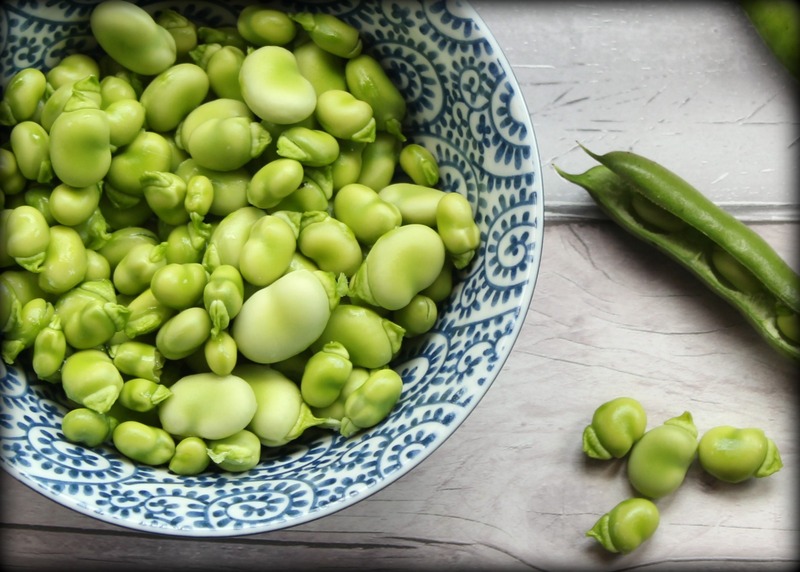 I’ll admit, I’m only a recent convert to broad beans (or fava beans, for our friends across the pond). I hadn’t eaten them since I was small – when I was never much a fan of the plain, boiled heap that would occasionally accompany the Sunday roast – but I was quite happy when Ade said he might grow them on the allotment, as I thought I could mince them into homemade falafel, which I love. We’re harvesting them at the moment, and although we’re never quite picking the quantity I’d need to make falafel, I’m discovering all sorts of other lovely uses for them. They’re wonderful in a risotto and, rather conveniently for these long, hot days we’re having, superb in a salad. This recipe was inspired by the tabbouleh I used to enjoy for lunch when I briefly worked in the Middle East a few years ago; a zingy mix of fresh herbs, bulgur wheat and tomatoes that was unexpectedly reviving when the desert sun had sapped all my energy. I’ve switched the tomatoes for broad beans in my recipe, as I wanted to use only the things we’re harvesting at the moment (sadly our tomatoes are not quite ready yet, but by all means, add a couple if you have them!) I also made a hot and sour dressing using one of the chillies I’d frozen from last year’s crop, to give the whole thing a fiery little hit. It works well as a light lunch, side dish or as part of a mezze, and is a wonderfully simple way to showcase the vegetables and herbs of the season. Cook the bulgur wheat according to packet instructions, adding the broad beans to the pan 3 minutes before the end of the cooking time (you may need to add a splash more water at this point). While they’re cooking, whisk together all the ingredients for the dressing. 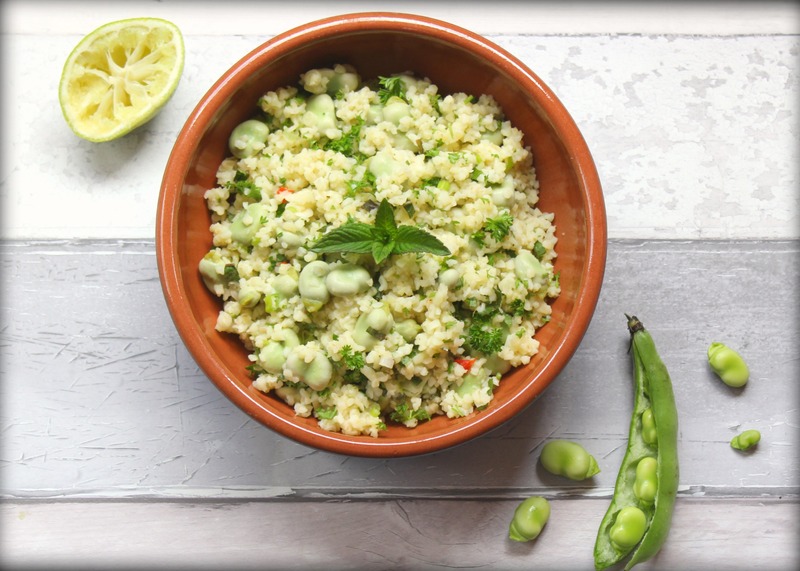 Drain the bulgur wheat and broad beans and allow to cool. Finely chop the spring onions, mint and parsley. 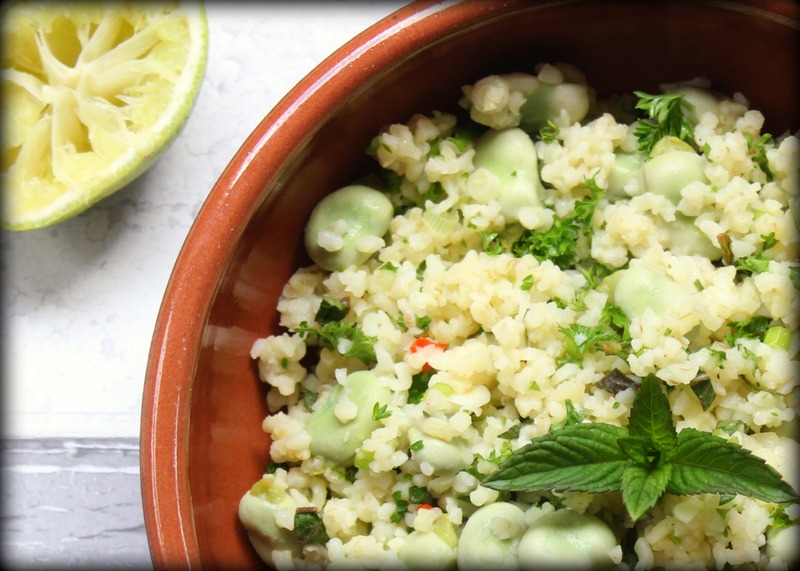 Tip the broad beans and bulgur wheat into a bowl, before adding the chopped spring onions, mint and parsley. Slowly pour over the dressing, mixing the salad as you go, making sure it is evenly coated. Add a little more seasoning if needed, fluff with a fork and serve. Like you, I never liked broad beans as a kid (that ‘boiled’ issue). However, since growing my own I’ve discerned how delicious they are raw 😃. Yum! A great summer dish.